Who doesn’t want to raise people friendly chickens? If you’re keeping backyard chickens, it’s pretty likely you’re also keeping them as pets. Yeah, yeah, they lay eggs, and that’s great, but they also make great pets, right? Which means you likely want to raise people friendly chickens. And luckily, that’s a pretty easy thing for anyone to do. It’s also pretty important if you have children – NOTHING is worse than a rooster who flogs your kids, or pecks bloody holes into you when you enter their coop. While the rooster is just doing his job, it’s also no fun to get beat up just for feeding your flock. 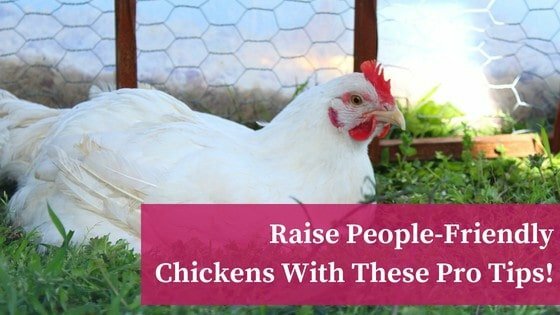 So, in this article, I’m going to show you how to raise people friendly chickens so you can have a flock that’s fun and enjoys your company as much as you enjoy theirs! Yes, it’s true that any chicken can be a lap chicken. We’ve had plenty of chickens of various breeds, and whether you can raise people friendly chickens with them largely comes down to how they’re handled and their individual personalities. But like dogs, some breeds of chickens have a tradition of being raised as companions to people, and so are MORE LIKELY to become your best friends. The list of breeds below isn’t comprehensive; it’s just to get you started! Like other bantams, polish bantams are gentle and more willing to be held than other breeds, They also look adorable with puffs of feathers on their heads! I seem to be alone in this opinion, but I think Cornish Crosses are great chickens as pets. They enjoy human company and being held, and love just sitting and watching the world go by. We’ve kept quite a few Cornish Crosses as pets, and they’ve consistently been great family members. The only drawback is they tend to have heart issues, and don’t seem to live as long as other breeds. If reared as pets, Rhode Island Reds are great for a starter backyard chicken flock. They have friendly natures. We used to have one hen named Daisy. She would do the “submissive squat” to indicate she wanted to be picked up and held. Such fun! Both of these breeds are friendly, and lay blue eggs! Araucanas originated in Chile, while Ameraucanas are a hybrid breed created in the United States. You can read more about araucana chickens here. It’s simpler to start from scratch when trying to raise people friendly chickens than try to retrain a hen that’s had little human contact. So, if you want your chickens to be members of your family, it’s best to get them when they’re chicks, and consistently interact with them. Now, there ARE exceptions: We’ve had hens we rescued from battery cages, and they made GREAT pets. So, in some cases, rescues will learn to enjoy human company and being spoiled, especially after they spent their lives being shut up in less than pleasant surroundings. But to be on the safe side, it’s easier to start with chicks and train them to enjoy human company. To raise chickens that enjoy human company and being handled by people, it’s crucial to spend time with them and make them your friends. If they don’t know you well or aren’t sure about your role in the flock, they’ll avoid you. It’s also important to let them know you’re the flock leader. The flock leader keeps them safe, shows them where food is, and keeps them comfortable. Spend an hour or so every day with your flock, give them treats, and play games with them. They’ll love it! Yep, it’s true. If you’re the “bringer of treats,” you’ll always be popular. Offer your flock treats from your hands, and spend time talking with them and bonding with them as you indulge them. Getting to know each individual chicken is important. You’ll get to know what makes each one unique, and what might help them bond with you. Does your chicken love black soldier fly larvae? Or is oregano the key to their hearts? Does fast movement scare them? Do they liked to be picked up a certain way? Knowing these individual preferences will help you help them stay comfortable in your presence! To raise people friendly chickens, they need to know people are their friends. And it helps if your flock understands you’re their food source. If your flock has to forage for food, they essentially have to fend for themselves. This leads to mistrust – they don’t know what to make of you, so they avoid you. In other words, they go wild. Now this isn’t to say foraging is bad. Quite the contrary – it’s a normal and healthy behavior. If you want to raise healthy people friendly chickens, then allow your hens to free range, but supervise their free ranging, and spend time with them as they forage. Offer them treats at the same time so they recognize you’ll always be there with a meal. You can make a game of it by scattering treats around and let them “hunt” for their dried insects! Learning how to raise people friendly chickens is easy – and get ready to have some new best friends! I just lost my Specked Sussex, Suzie, to a raccoon. She was everything you say here. She was always the first to spot me in the yard and would come running. Was always front in line for the treats from my hand and was such a clown. Miss her a lot. You bet I will be getting another Sussex next sprint. I am a first time chicken owner. My chicks are 11 weeks old. I am doing all the things you listed, but they still run when I try to pick them up. Do you have other suggestions. I really want them to be lap chickens. Oh, I have a New Hampshire Red a Plymouth Barred Rock and a Buff Orpington. The way to a chicken’s heart is definitely through it’s stomach! 😉 I’ve got 8 week old chickies who fly up onto me when I come into the coop….whether or not I’m holding any food! I sometimes spend an hour or two a day (when I have time) sitting in the run with my flock of 9(one rooster, 5 hens, and 3 chicks), feeding them treats, talking to them, and often just watching them…It’s so calming to hear them cheeping/clucking away while they scratch around looking for buried goodies, or take dust baths, or just sit and “hum”…yes…my odd flock hums! (actually it sound more like a small child’s sound when they dont want to do what you asked them to, but I like to call it humming! 😉 ). Often, right about the time I decide it’s time to go back to the house and get something done…like starting dinner…one or two, or sometimes all three chickies hop up onto my knee or my arm, and hunker down for a nap! It just warms my heart! …and sometimes makes me stay in the run a good 1/2 hour longer than I had planned! LOL! I’m waiting with bated breath to see if one or two of em turns out to be a rooster…they’re starting to show signs….they’re absolutely gorgeous for one, but their legs are also thicker, and their combs are wider and more pink than the one that I’m sure is a girl. But one is pure Ameraucana, and the other is Ameraucana/Buff Orp cross(as is the one I’m sure is a girl), so I cant really say for sure that any of those signs is difinitive…I’m waiting for the saddle feathers to come in before I start crying :-\ I really dont need more roosters! 🙁 …but I guess that’s the risk you run when you let your broody have a clutch of eggs to raise, right? I’m desperately hoping they’re all girls…or at least if there’s a roo or two in there, that they’ll get along with Gregory Peck…he can be a bit of a bast…. :-\ But I digress…all three of my chickies are super friendly…MUCH more human-centric than any of their parents were! I had raised them in a cardboard box brooder, and while I did pick them each up every day for a bit…I wasn’t able to just sit with them all and give them treats while they went about their business every day…I think that made all the difference!